8.NS.1 Know that numbers that are not rational are called irrational. 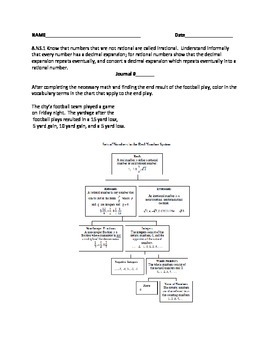 Understand informally that every number has a decimal expansion; for rational numbers show that the decimal expansion repeats eventually, and concert a decimal expansion which repeats eventually into a rational number. These files consist of questions relating to standard 8.NS.1 in pre-assessment form (11 questions) , a journal question math application questions, and a post-assessment (25 questions). 1. How do you distinguish between rational and irrational numbers? 2. 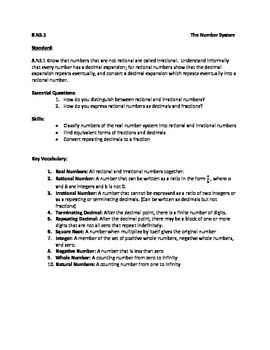 How do you express rational numbers as decimals and fractions?